Dr. Mila Paltac’s skilled dental team provides advanced orthodontics services at their Saddle Brook, NJ, practice, to straighten even the most crooked teeth. Our resident orthodontist, Dr. Joseph Anithottam, has provided treatment for over 20 years, to children, teens, and adults, with cases of misalignment ranging from mild to severe. Whether you opt for the power of traditional braces or the subtlety of Invisalign®, your doctor can help you to achieve the smile you have always wanted. Orthodontic practitioners focus on straightening teeth, aligning the patient's bite, and closing any gaps between teeth. Aligned teeth are often easier to keep clean, lowering a patient's risk of developing periodontal disease and other oral health conditions. Orthodontics can also positively impact patients' self-esteem. Patients may be self-conscious about crooked teeth, a misaligned bite, or gaps in their smiles. Utilizing cutting-edge orthodontic treatment, we seek to improve your oral health, the aesthetics of your smile, and your self-confidence. We offer two proven methods of orthodontic care: traditional braces, and the Invisalign® system. 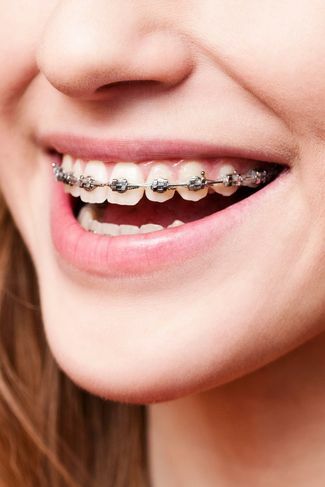 Traditional braces: Braces consist of a series of brackets attached to the teeth, connected to one another by a loop of elastic bands and wire. Your orthodontist will tighten the wires every four to six weeks, and your teeth will gradually move into the desired position. At Dental Health, we offer patients the option of metal, clear, and ceramic braces. Full treatment typically lasts between one and three years. After braces are removed, patients typically wear a retainer at night to maintain results. Invisalign®: A fast and discreet method of straightening teeth, the Invisalign® system adjusts the position of your teeth using clear, custom-made trays called aligners. Each set of aligners is worn for two weeks, then switched to the next set. This process continues until teeth reach the desired position. Patients can remove aligners to eat, brush, and floss. Traditional Invisalign® treatment takes twelve months, on average. Invisalign Express® can reduce that time to just six months. Whether you opt for the power of traditional braces or the subtlety of Invisalign®, your doctor can help you to achieve the smile you have always wanted. Sometimes, a patient’s upper jaw is too small in proportion to the lower jaw, leaving him or her with a misaligned bite. These patients will need to wear a palate expander to widen the upper jaw before orthodontic treatment can proceed. In other cases, patients may suffer from impacted teeth that are unable to break through the gums. This can cause a slew of oral health problems, including overcrowding and an increased risk of infection. Our oral surgeon can determine whether it is best to remove an impacted tooth, or work with our orthodontist to expose the tooth, attach brackets, and slowly pull it into its proper position. After your orthodontic therapy is complete, you will need to wear a retainer or other removable appliance to ensure that your teeth do not return to their pre-treatment position, maintaining your beautiful results. With our expert team composed of specialists in every field of dentistry, we offer patients uniquely comprehensive service. Contact us today to schedule a consultation, and learn more about how our orthodontic treatment can help you achieve the smile of your dreams.